Racing enthusiasts will remember the sound of the BRM V16 long after memories of modern racing cars have faded - the pitch and sheer volume of its 16-cylinder scream, which reputedly distracted seasoned drivers in cars alongside on grids in the 1950s, has never been matched. Deeper memories will be of a promise which soon gave way to fiasco. Raymond Mays and Peter Berthon made paper plans during World War II, visualising a project in the grand manner of the German state aided and abetted teams of the late 1930s. They sought support from British industry, looking for contributions in cash or kind. 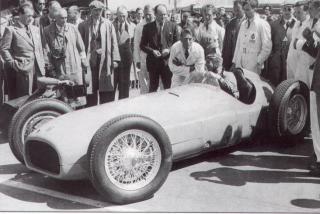 In 1946 more than a hundred companies backed the project and it began to be seen as the British national Grand Prix car. Inevitably, committees were set up. Late in 1947 there was an 11-member main committee, a production committee, a finance and planning committee, and a publicity committee. But work had to start in a derelict barn, and Berthon's staff for a complex project comprised four designers and three draughtsmen. Finance was far from realistic - £25,000 per season was the first budget, although a year or so into the programme this was doubled. The car took shape much as Berthon and Mays had always envisaged it, but slowly. The approach was cautious, but a bigger problem was delay in the supply of components. The first car was completed in December 1949, and demonstrated on the bleak airfield at Folkingham. The Type 15 was compact and low, cleanlined, and built to very high standards, but there were grave errors in its conception. 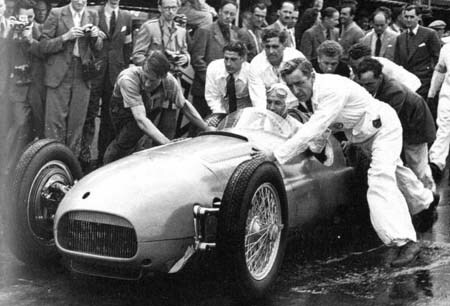 Throughout the first half of 1950 there were tests and problems, more tests and more problems - to the point where the British Grand Prix meeting was held with no more than a demonstration of the pale green car. Already misgivings were widespread, although the worry expressed by The Autocar in December 1947 would surely be wide of the mark after all that testing: "A worse debut than that of the French Arsenal, which failed to leave the line at the start of its first race, cannot be imagined." That is precisely what happened at Silverstone in August 1950. Uncannily, Raymond Sommer had been in the cockpit of the CTA-Arsenal at Lyon in 1947 and he was the BRM driver for its debut, and both cars failed to get away from the grids as driveshafts failed. The French 'national racing car' never raced again, but BRM salvaged something a month later, at Goodwood. In the rain and windy conditions there were no overheating problems in five-lap and 12-lap races on the 2.4-mile circuit, and Reg Parnell kept the BRM on the island to win both. That encouraged the team to enter two cars in the Grand Prix of' Penya Rhin on Barcelona's Pedralbes circuit, to meet front-line Continental opposition. The then-new 4.5-litre unsupercharged Ferraris dominated the meeting. The BRMs matched them only in outright speed, timed over a kilometre. On the long straight, Parnell achieved 186 mph 1n a BRM. the best of the Ferraris reached 178 mph. So, in that respect, complexity gave a slender advantage over simplicity, but just how much was lost in corners can be seen from lap times: Ascari placed a Ferrari on pole in 2 minutes 23.8 seconds, while Parnell qualified the best of the BRMs in 2 minutes 30,4 seconds, some 4mph slower. In the race Parnell retired on lap two when the Supercharger drive failed, while Walker got the other car up to fourth - a distant fourth, behind Manzon in a homely four cylinder pushrod Gordini - before he too retired. The cars did not race again for eight and a half months. Quite what was learned at Barcelona and in more testing at Folkingham was not clear, especially as the cars arrived late for the one 1951 event the team could not afford to miss at any price: the British Grand Prix. Performance at Silverstone could be presented as encouraging for the dwindling band of BRM supporters, or they could be taken to prove the folly of the whole project. Two cars did finish - fifth and seventh - five and six laps down on the race winner. Only the fortitude of Reg Parnell and Peter Walker in cruelly overheated cockpits saw them through to the end of the BRM V16's only World Championship race. The team went to Monza for the Italian Grand Prix, where Fangio took pole position in an Alfa Romeo 159 and Parnell's time, 19.9 seconds slower, would have put his BRM eighth on the grid. Presumably he would have been lapped very early in the race - if he had started. As it was the team withdrew. During the winter the steering was modified, disc brakes were fitted, the engine air in takes made larger and cockpit air intakes introduced. BRM went testing at Monza early in 1952. This, Mays assured race organisers, was in preparation for a full season. Alfa Romeo had withdrawn from racing, and the organisers needed BRM to provide some opposition to Ferrari. But then the BRM entry for the non-championship Turin Grand Prix in April was withdrawn, testing had higher priority. That was all the governing body needed: World Championship races were run to Formula 2 regulations in 1952-53, so the V16 was no longer eligible. BRM had scored a clinching own goal. Ironically, the cars were then raced by top flight drivers, including Juan Manuel Fangio, who was prepared to take the V16 by the scruff of the neck and give it the work-out it should have had somewhere among all testing. In 1952 the cars were run once outside Britain at Albi. In the hands of Fangio and Gonzalez the BRMs were the fastest things on the circuit. They briefly ran first and second in the race, but BRM came away with a lap record and two retirements with failed engines. Many supporters had deserted by this time, most notably G.A. Vandervell who set out to build his own car to beat the Italians. Before the end of 1952 BRM Ltd was taken over by another of its early supporters, Alfred Owen. Meanwhile, the V16s were still run, most notably at Albi again in 1953. BRM versus Ferrari and Thin Wall Ferrari attracted a vast crowd to see what might have been. The principal Ferraris soon retired. After winning the Formula Libre heat at a speed higher than the lap record (at 110.84 mph/178.37 km/h), Fangio retired from the final when a rear tyre on his BRM threw a tread. Wharton crashed heavily and Gonzalez's car threw two treads but he raced aggressively to finish second. Tyres apart - and there was wonderment that in the cars' fourth season their exhausts still played on the rear tyres - the BRMs at Albi in May 1953 did show what should have been years earlier, with the sheer thrill of highly supercharged cars flat-out at speeds up to 190 mph on a road circuit. But by then it was all too late for over-complicated BRM. The complex, supercharged V16 was at least orthodox in its layout and the 1947 design target power output of 300 bhp appeared adequate. However, it was not generous, for the simple straight-eight in the Alfa Romeo 158, the car to beat, was rated at 254bhp in 1946 and 300bhp in the 1947 model. There was, however, more development potential in the V16, and it was envisaged that it would be a competitive power unit through to 1953. In the early days it was estimated that by 1953, 600 bhp at 12,000 rpm would be achieved. The short-stroke, high-revving Vl6 had its cylinder banks at an included angle of 35 degrees, with alloy cylinder heads and block, and tiny cast-iron liners (a weak point, as they broke up when coolant leaked into the cylinders). The engine could be regarded as a pair of 744cc V8s with a common two-piece, 10-bearing crankshaft. There was a half speed power take-off at its centre, with trains of gears operating the twin overhead camshafts. The drive for the supercharger was taken from the front of the output shaft, forward via a gear train. Rolls-Royce played a leading role in the development of the two-stage centrifugal supercharger, a type well suited to engines with constant speeds or progressive demands, but not ideal where flexibility was called for. This major drawback was apparently accepted at the concept stage, as a centrifugal supercharger would be efficient at high engine speeds, and it was compact and light. Apparently the characteristic that torque increases with power, instead of falling away as engine revs increase, was not an early worry. Rolls-Royce developed a throttle system to regulate boost pressure, but this was not used on the BRM installation because of breathing problems (resulting from inadequate valve lift). These shortcomings also meant that the supercharger was run at four times engine speed, instead of the intended 3.25 times engine speed. The original engine design envisaged an SU fuel injection system, but this was fitted only briefly, and throughout its racing life the VI6 was fed by two large SU carburettors. By 1954 when the MkII appeared the V16 was reasonably reliable, and its effective power output was of the order of 430-440 bhp. Mays tended to talk of 600bhp, but 485bhp seems to have been the real absolute maximum, although it was not achieved in racing conditions. In its layout, chassis and running gear, this first BRM tended to reflect the past rather than look forward. The chassis comprised two 'double-tube' 2.5"-diameter main members superimposed tubes linked by welded-on sheet steel - with a large diameter cross-tube at the front, a twin-tube and sheet cross-member on the line of the front of the seat, and two single-tube cross-members further aft. This structure was light and stiff. Porsche-type trailing-link suspension was used at the front - as it had been on the C- and E-type ERAs. It was an outmoded arrangement, and deflection in the trailing arms made for poor handling. The de Dion layout at the rear closely followed the 1938 Mercedes-Benz design. The first radius arms were pressings, which were replaced by conventional tubular rods. Springing was by Lockheed oleo-pneumatic struts, which were confidently expected to supersede conventional coil springs and dampers in general use, but didn't. 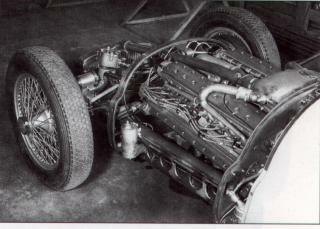 Three-leading-shoe 14" Girling drum brakes were fitted to the V16 MkI, while the MkII had Girling disc brakes. The driveshaft ran back at a slight angle, between the driver's feet and then to the left of his seat, to a transverse five-speed gearbox. Fuel was carried on two aluminium tanks in the tail and straddling the scuttle; maximum capacity was 5 gallons, substantially reduced in the Mk II, which was generally run n short sprint races. Bodywork was in aluminium, and in its first form this was a sleek little car (yes, little - it was substantially small; in every external dimension than a modern Formula 1 cars. The reality of running the V16 soon meant that cooling air intakes became larger. The BRM V16s started 73 times, in 45 races, including their debut in the Silverstone International Trophy in August 1950 when the first car moved only yards before a driveshaft failed as the flag was dropped. The cars - a pair of them - ran through only one championship Grand Prix. The overall figures look reasonable at a glance, but most of the results were achieved in insignificant sprint races on secondary British circuits. For the record, those 3 starts reaped 19 firsts, 14 second placings and eight thirds, plus eight more finishes, to set against 24 retirements. Six of those victories were gained in the MkII version first raced after the end of the 1.5-litre F1 formula. Its results are not listed in the chart below.